You can run a GitLab Mattermost service on your GitLab server. GitLab Mattermost is compiled and manually tested each release on an AMD 64 chipset for Linux. ARM chipsets and operating systems, like Raspberry PI, are not supported. GitLab Mattermost expects to run on its own virtual host. In your DNS you would then have two entries pointing to the same machine, e.g. 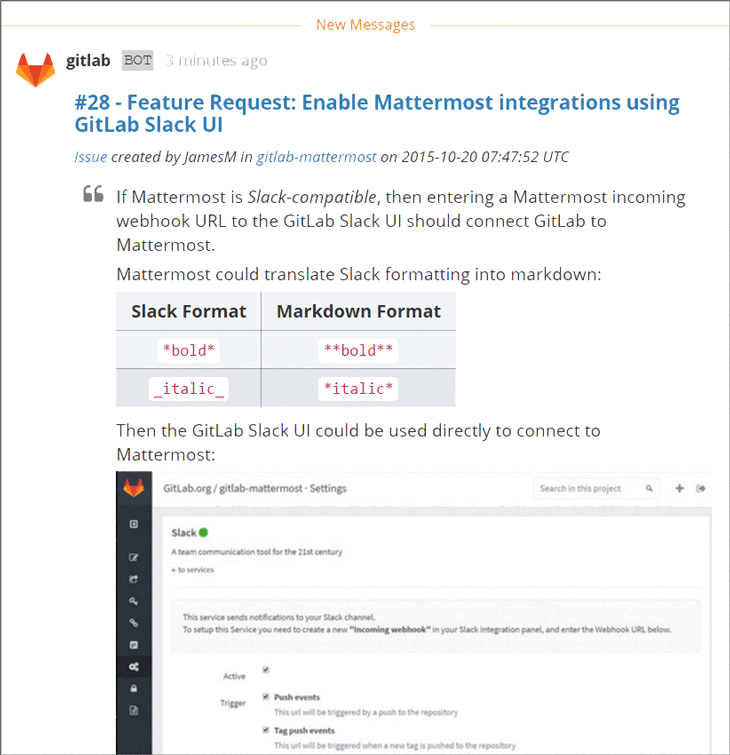 gitlab.example.com and mattermost.example.com. After you run sudo gitlab-ctl reconfigure, your GitLab Mattermost should now be reachable at http://mattermost.example.com and authorized to connect to GitLab. Authorising Mattermost with GitLab will allow users to use GitLab as SSO provider. Omnibus-gitlab package will attempt to automatically authorise GitLab Mattermost with GitLab if applications are running on the same server. This is because automatic authorisation requires access to GitLab database. If GitLab database is not available you will need to manually authorise GitLab Mattermost for access to GitLab. If you want to run GitLab and GitLab Mattermost on two separate servers you can use the following settings and configuration details on the GitLab Mattermost server to effectively disable the GitLab service bundled into the Omnibus package. The GitLab services will still be set up on your GitLab Mattermost server, but they will not accept user requests or consume system resources. Then following the details in Authorise GitLab Mattermost section. To enable integrations with GitLab, add the following on the GitLab Server: ruby gitlab_rails['mattermost_host'] = "https://mattermost.example.com"
By default GitLab Mattermost will force all users to sign-up with GitLab and disable sign-up by email option. See Mattermost documentation on GitLab SSO. (replace http with https if you use https). Once the application is created you will receive an Application ID and Secret. One other piece of information needed is the URL of GitLab instance. Save the changes and then run sudo gitlab-ctl reconfigure. If there are no errors your GitLab and GitLab Mattermost should be configured correctly. To reauthorise GitLab Mattermost you will first need to revoke access of the existing authorisation. This can be done in the Admin area of GitLab under Applications. Once that is done follow the steps in the Authorise GitLab Mattermost section. Starting in GitLab 11.0, Mattermost can be configured using the Mattermost System Console. An extensive list of Mattermost settings and where they can be set is available in the Mattermost documentation. While using the System Console is recommended, you can also configure Mattermost using one of the following: 1. You can edit the Mattermost configuration directly through /var/opt/gitlab/mattermost/config.json. 1. You can specify environment variables used to run Mattermost by changing the mattermost['env'] setting in gitlab.rb. Any settings configured in this way will be disabled from the System Console and cannot be changed without restarting Mattermost. Before GitLab 11.0, Mattermost should be configured through gitlab.rb. Changes could also be made through the System Console, but any changes made outside of gitlab.rb would be overwritten. See the upgrade section for more details. Place the ssl certificate and ssl certificate key inside of /etc/gitlab/ssl directory. If directory doesn’t exist, create one. If you haven’t named your certificate and key like mattermost.gitlab.example.crt and mattermost.gitlab.example.key then you’ll need to also add the full paths like shown below. where mattermost-nginx.crt and mattermost-nginx.key are ssl cert and key, respectively. Once the configuration is set, run sudo gitlab-ctl reconfigure for the changes to take effect. As of GitLab 11.0, these settings are configured through the Mattermost System Console by a user logged into Mattermost as a System Administrator. On the Notifications > Email tab of the System Console, you can enter the SMTP credentials given by your SMTP provider or 127.0.0.1 and port 25 to use sendmail. More information on the specific settings that are needed is available in the Mattermost documentation. These settings can also be configured in /var/opt/gitlab/mattermost/config.json. SMTP configuration depends on SMTP provider used. Note that the configuration keys used are not the same as the ones that the main GitLab application uses, for example the SMTP user in Mattermost is email_smtp_username and not smtp_user_name. email_connection_security depends on your SMTP provider so you need to verify which of TLS or STARTTLS is valid for your provider. Then, run sudo gitlab-ctl reconfigure for the changes to take effect. This setting can also be configured in /var/opt/gitlab/mattermost/config.json. For additional configuration settings, see the Mattermost documentation. Note: These upgrade instructions are for GitLab Version 8.9 (Mattermost v3.1.0) and above. For upgrading versions prior to GitLab 8.9, additional steps are required. It is possible to skip upgrade versions starting from Mattermost v3.1. For example, Mattermost v3.1.0 in GitLab 8.9 can upgrade directly to Mattermost v3.4.0 in GitLab 8.12. Starting with GitLab 11.0, GitLab Mattermost can be upgraded through the regular GitLab omnibus update process. When upgrading GitLab prior to that, that process can only be used if Mattermost configuration settings have not been changed outside of GitLab. This means no changes to Mattermost’s config.json file have been made, either directly or via the Mattermost System Console which saves back changes to config.json. If you are upgrading to at least GitLab 11.0 or have only configured Mattermost using gitlab.rb, you can upgrade GitLab using omnibus and then run gitlab-ctl reconfigure to upgrade GitLab Mattermost to the latest version. Update gitlab.rb with the changes done to config.json This might require adding some parameters as not all settings in config.json are available in gitlab.rb. Once complete, GitLab omnibus should be able to upgrade GitLab Mattermost from one version to the next. Migrate Mattermost outside of the directory controlled by GitLab omnibus so it can be administered and upgraded independently (see below). Starting in Mattermost v4.2, user-supplied URLs such as those used for Open Graph metadata, webhooks, or slash commands will no longer be allowed to connect to reserved IP addresses including loopback or link-local addresses used for internal networks by default. This change may cause private integrations to break in testing environments, which may point to a URL such as http://127.0.0.1:1021/my-command. If you point private integrations to such URLs, you may whitelist such domains, IP addresses, or CIDR notations via the AllowedUntrustedInternalConnections config setting in your local environment. Although not recommended, you may also whitelist the addresses in your production environments. Starting in Mattermost v4.2, Mattermost now handles multiple content-types for integrations. Make sure your integrations have been set to use the appropriate content-type. For a complete list of upgrade notices from older versions, see the Mattermost documentation. With version 11.0, GitLab will introduce breaking changes regarding Mattermost configuration. In versions prior to GitLab 11.0 all Mattermost related settings were configurable from the gitlab.rb file, which generated the Mattermost config.json file. However, Mattermost also permitted configuration via its System Console. This configuration ended up in the same config.json file, which resulted in changes made via the System Console being overwritten when users ran gitlab-ctl reconfigure. To resolve this problem, gitlab.rb will include only the configuration necessary for GitLab<=>Mattermost integration in 11.0. GitLab will no longer generate the config.json file, instead passing limited configuration settings via environment variables. The settings that continue to be supported in gitlab.rb can be found in gitlab.rb.template. With GitLab 11.0, other Mattermost settings can be configured through Mattermost’s System Console, by editing /var/opt/gitlab/mattermost/config.json, or by using mattermost['env'] in gitlab.rb. Upgrade to version 10.x which supports the new mattermost['env'] setting. Configure any settings not listed above through the mattermost['env'] setting. Mattermost requires environment variables to be provided in MM_<CATEGORY>SETTINGS_<ATTRIBUTE> format. Below is an example of how to convert the old settings syntax to the new one. Refer to Mattermost Documentation for details about categories, configuration values, etc. ServiceSettings.ListenAddress configuration of Mattermost is configured by mattermost['service_address'] and mattermost['service_port'] settings. Configuration settings named in an inconsistent way are given in the following table. Use these mappings while converting them to environment variables. Please note: GitLab 11.0 will no longer generate config.json file from the configuration specified in gitlab.rb. Users are responsible for managing this file which can be done via Mattermost System System Console or manually. If a configuration setting is specified via both gitlab.rb (as env variable) and via config.json file, environment variable gets precedence. After upgrading to GitLab 8.9 additional steps are require before restarting the Mattermost server to enable multi-account support in Mattermost 3.1. Confirm you are starting with version GitLab 8.8. This is especially important in the 8.9 upgrade since the database upgrade cannot be reversed and is incompatible with previous versions. In ` /etc/gitlab/gitlab.rb set mattermost[‘db2_backup_created’] = true` to verify your database backup is complete. In ` /etc/gitlab/gitlab.rb set mattermost[‘db2_team_name’] = “TEAMNAME”` where TEAMNAME is the name of your primary team in Mattermost. If you use only one team in Mattermost, this should be the name of the team. If you use multiple teams, this should be the name of the team most commonly used. When Mattermost 3.1 upgrades the database with multi-team account support user accounts on the primary team are preserved, and accounts with duplciate emails or usernames in other teams are renamed. Users with renamed accounts receive instructions by email on how to switch from using multiple accounts into one multi-team account. For more information, please review the Mattermost 3.0 upgrade documentation. Run your GitLab 8.9 upgrade as normal. This installs the Mattermost 3.1 binary and will attempt to auto-upgrade the database. Your Mattermost database will be upgraded to version 3.1 and the server should start. You’ll see an “Automatic database upgrade failed” error on the command line and Mattermost will not start if something goes wrong. Log in as root or user with super user access and re-run sudo gitlab-ctl reconfigure. For any questions, please visit the GitLab Mattermost troubleshooting forum and share any relevant portions of mattermost.log along with the step at which you encountered issues. Follow the Mattermost Migration Guide to move your Mattermost configuration settings and data to another directory or server independent from GitLab omnibus. If you choose to upgrade Mattermost outside of GitLab’s omnibus automation, please follow this guide. There are multiple ways to send notifications depending on how much control you’d like over the messages. If you are using GitLab 11.0 or newer, you can enable incoming webhooks from the Integrations > Custom Integrations section of the Mattermost System Console. If you are using an older version of GitLab Omnibus, enable incoming webhooks from the gitlab.rb file. Any issues, please see the Mattermost Troubleshooting Forum. You can also set up the open source integration service to let you configure notifications on GitLab issues, pushes, build events, merge requests and comments to be delivered to selected Mattermost channels. This integration lets you completely control how notifications are formatted and, unlike Slack, offers full markdown support. omnibus-gitlab creates a user and group mattermost. You can specify the numeric identifiers for these users in /etc/gitlab/gitlab.rb as follows. Should you need to use the Mattermost Command Line Tools (CLI), you must be in the following directory when you run CLI commands: /opt/gitlab/embedded/service/mattermost. Also, you must run the commands as the user mattermost and specify the location of the configuration file. The executable is /opt/gitlab/embedded/bin/mattermost. For more details see Mattermost Command Line Tools (CLI).